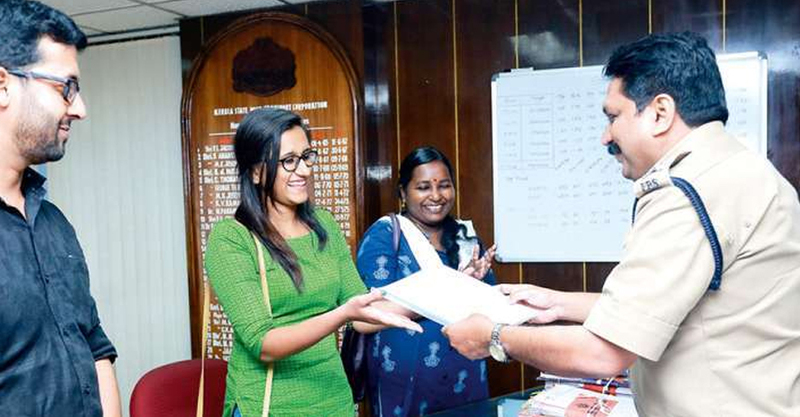 The girl who is a huge fan of KSRTC’s RSC 140 bus has revealed her identity. Kappadu native Rosmi i who became a star in social media after her voice clip with KSRTC official went viral. On Tuesday, she visited KSRTC Managing Director Tomin J Thachankary at Thiruvananthapuram. Rosmi has made a phone call to KSRTC office to complain on shifting RSC 140 bus from Erattupetta depot to Aluva depot. The phone call has gone viral on social media and people were eagerly waiting to identify this KSRTC fan. “It is our ‘Chanku’ (favourite) bus. Why did they take it to Aluva? Is Aluva having shortage of buses?” asked Rosmi by phone to Aluva depot inspector CT Johny. Though the official asked her name, she refused to disclose her identity. “I am a degree student and a regular passenger in the bus. There are many passengers who are fond of this bus,” she told the KSRTC official. After her phone call went viral on social media, the bus was shifted to Erattupetta as directed by Tomin J Thachankary. The bus fans have put a sticker written ‘Chanku’ on the front and back glass of the bus. KSRTC RSC140 Venad bus that was taken to Aluva depot and later to Kannur reached Erattupetta on April 18. It resumed service on April 19. Rosmi is an Aviation student in Kottayam. “I have been a regular passenger in the bus since a year. I really love the bus. I was tensed that whether we will lose the bus. So I phoned KSRTC depot at Aluva.